HSA has been annually organizing theInternational Eurasian Hematology Congress, one of the largest medical meetings in Turkey since 2010. The International Eurasian Hematology Congress is a scientific event providing latest developments on clinical and experimental researches in hematologic disorders and establishing an international collaborative network of medical professionals. 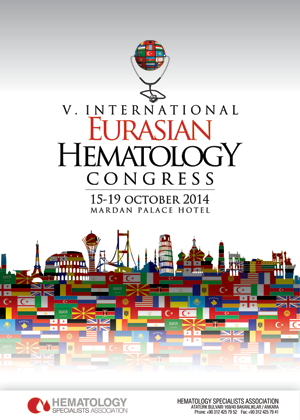 The 5th International Eurasian Hematology Congress was held with great success on 15-19 October, 2014, in Antalya, Turkey. This event attracted over 800 delegates, 300 of them from 34 different countries. Sixty five world known speakers presented their latest research findings and perspectives on the hematologic diseases. All delegates had opportunity to participate in group discussions and share their ideas and experiences. Moreover, a number of selected abstracts were published in the supplement of Leukemia Research journal.